Olivia Faber, aged 24, from the Isle of Wight, attended the Equine Assisted Learning Centre after a spell in hospital, which inspired her to become a Learning Champion and gave her plans for the future in spite of her cerebral palsy. Her learning achievements are being recognised with a South East Regional Individual Learner Award as part of Adult Learners’ Week 18 – 24 May 2013. 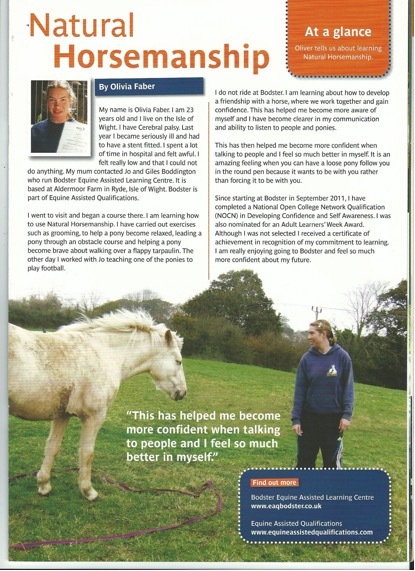 Having been ill in hospital and feeling very low, Olivia began attending Bodster Equine Assisted Learning Community Interest Company on the Isle of Wight in September 2011. Olivia has cerebral palsy and has had a stent fitted. During her Equine Assisted Learning sessions, Olivia completed tasks with the ponies on the ground, such as leading a pony around an obstacle course, problem solving how to have a pony walk into a circle of rope, and having a pony choose to walk with her loose in a ‘round pen’. As a result, Olivia’s confidence began to grow, her motor skills improved and she became more self-aware and clearer in her communication and ability to listen to both horses and people. Olivia learned new skills by undertaking an NOCN Level 1 course in Developing Personal Confidence and Self Awareness, which she completed in July 2012. Olivia saw the benefits of learning and became a Learning Champion, encouraging others to give learning a go and gain new skills. Olivia also became a volunteer at Bodster on the Never Too Old project, helping older learners and teaching them the skills that she had learned herself. “Prior to starting her learning, Olivia was doing nothing in the community and not interacting with anyone but her family,” said her nominator, Jo Boddington. Now, Olivia is studying a second NOCN Level 1 qualification in Healthy Living at Bodster and attending a local literacy and numeracy course to improve her work skills. “I now feel that in a year or so I could do a part-time job – I never thought I would be able to say this,” explained Olivia. Skills Minister Matthew Hancock said, “The achievements of this year’s NIACE Adult Learners’ Week winners are inspirational. Each winner demonstrates the life changing benefits education offers.